We’d love your help. Let us know what’s wrong with this preview of I So Don't Do Spooky by Barrie Summy. Someone’s out to get Sherry’s stepmom. . . .Can she save her before it’s too late? Did you know that the main campus of the Academy of Spirits is at a Dairy Queen in Phoenix? Me either. Until now. Some weird stuff has been happening to my stepmother, Paula, and the Academy has asked me, Sherry Holmes Baldwin, to get to the bottom of it. They think someone’s trying to hurt h Someone’s out to get Sherry’s stepmom. . . .Can she save her before it’s too late? Did you know that the main campus of the Academy of Spirits is at a Dairy Queen in Phoenix? Me either. Until now. Some weird stuff has been happening to my stepmother, Paula, and the Academy has asked me, Sherry Holmes Baldwin, to get to the bottom of it. They think someone’s trying to hurt her. I really don’t want to get involved—my life is way too busy. Josh and I are celebrating two blissful months of togetherness. And my best friend, Junie, is finally showing a teeny bit of interest in clothes and makeup after years of brainiac behavior. But being that my mom is a ghost and all, me, my brother, and my dad rely on Paula a lot. So it’s not like I can just ignore what’s going on. Especially since my mom is competing at the Ghostlympics. If she comes in first place, she earns five minutes of Real Time. And that means I’ve got to get involved in a creepy, freaky mystery. To ask other readers questions about I So Don't Do Spooky, please sign up. From its title alone, I was cautious about reading this book, assuming that it would be one of those YA novels where adults try to write using the dialogue of kids today (or at least, what is presumed to be the way kids act and speak today). I So Don't Do Spooky turned out to be a lot better than that. A comedic paranormal story with numerous themes from family unity, romance and the supernatural, this book was great and I ended up really liking it. In I so don't do spooky, the second book in the I so don't mysteries, Sherry is ready to sleuth and have some fun! Sherry's stepmother has a stalker and Sherry's mom wants her to track down the stalker. Sherry isn't very positive that her step mom, Paula, has a stalker but then she sees some weird things happening. Paula's tires are slashed, she becomes disorganized, (she is a control freak) her car keys go missing for hours and someone is sabotaging Paula's robot team at school. By the time She In I so don't do spooky, the second book in the I so don't mysteries, Sherry is ready to sleuth and have some fun! Sherry's stepmother has a stalker and Sherry's mom wants her to track down the stalker. Sherry isn't very positive that her step mom, Paula, has a stalker but then she sees some weird things happening. Paula's tires are slashed, she becomes disorganized, (she is a control freak) her car keys go missing for hours and someone is sabotaging Paula's robot team at school. By the time Sherry figures this out, she is afraid it is too late. Will Sherry catch the Stalker? Sherry "Sherlock" Holmes Baldwin is back and better than ever. In this new mystery Sherry is even more outgoing and outspoken. With her boyfriend, Josh and her best friend Junie she goes looking for the ghosts and I absolutely loved it. A good read! It was a good book I would not mine reading it again. So I read this book because I had it on my bookshelf, and because I'm trying to read all the books I own, and also because my friend Cameron got it for me forever ago as a gift. In like 6th grade. She was basically like, "You like books, right? Here you go!" And then a copy of I So Don't Do Spooky suddenly belonged to me. This was a difficult rating to decide on, but I just gave it 2.5 stars because while it certainly did have things that I enjoyed, it mostly had aspects that wer So I read this book because I had it on my bookshelf, and because I'm trying to read all the books I own, and also because my friend Cameron got it for me forever ago as a gift. In like 6th grade. She was basically like, "You like books, right? Here you go!" And then a copy of I So Don't Do Spooky suddenly belonged to me. This was a difficult rating to decide on, but I just gave it 2.5 stars because while it certainly did have things that I enjoyed, it mostly had aspects that were either flat, poorly written, or I just didn't like. Characters: This category is a big one, since there were many characters that played a variety of somewhat important roles. The main character, Sherry, was actually really mean. She was mean to her family, her best friend, her boyfriend, and basically everyone she met throughout the story. In the end, she did some pretty selfless things, but she was still rude and mean to friends and other people when talking to them- or about them. And all of her meanness goes unpunished, after making unreasonable demands on her friends and demeaning their hobbies for the entire book, they still think she's the best! Plot: The plot was fun, and I can see why it would appeal to kids in middle school. It has fun, friends, a mystery, a devoted boyfriend, and even ghosts. I knew several people on middle school who would have loved to lead the life of the characters in the book. But the thing is, a lot of events just don't make any sense. The ghostly aspect is especially dripping in plot holes, but the whole thing (no pun intended) has continuity issues as well. Also, the plot twists were quite obvious, and I guessed them all before they happened. A younger person, I think, could have as well, and I think that this book kind of talks down to kids in that it assumes that they cannot guess the plot twists. Also, the book tries to imitate teen texting, which is hilariously inaccurate at best, and cringe-worthy at worst. Plot and plot development rating: 2.5/5 stars. Other: Other than the things I mentioned earlier, the book was slow. Buuuuut there were enjoyable things as well! The emotions of a daughter and her mother were captured very well, which is good since it was one of the main themes of the book. Also, there is a sense of fun in this book that I think is lost in a lot of young adult books. There's fear and sadness and everything too, but this book is very optimistic and lighthearted at its heart. I really liked this aspect of it. Other things rating: 4/5 stars. These three ratings average out to 2 and 2/3 stars, but its really more like 2.5 stars because the first two categories are more important to me. This review has been hidden because it contains spoilers. To view it, click here. Sherry's stepmother "The Ruler" has been having some super weird things happening to her. Sherry and her friend Junie, who now shows interest in makeup, want to help find out what is going on. They also get some help from Sherry's ghost mom, who can only be summoned by the smell of coffee beans, and who is enrolled in the Academy of Spirits. But some things will get in the way. Like her and her boyfriend, Josh, and their two month anniversary. Also her mom will be training for the Ghostlympics s Sherry's stepmother "The Ruler" has been having some super weird things happening to her. Sherry and her friend Junie, who now shows interest in makeup, want to help find out what is going on. They also get some help from Sherry's ghost mom, who can only be summoned by the smell of coffee beans, and who is enrolled in the Academy of Spirits. But some things will get in the way. Like her and her boyfriend, Josh, and their two month anniversary. Also her mom will be training for the Ghostlympics so she can earn 5 minutes of Real Time, where she gets to see her mom in person, with her mother. Donner's robotics team is also out to get them, and their leader Claire might be hiding somethings that might help Sherry find out what ghost is messing with her step mom. In the end it will be all up to Sherry to get this Spooky behavior to finally go away. You know how sticky it can sometimes get when you're juggling both a mother and a stepmother? Imagine if your mother was a ghost and your stepmother was a teacher at your school! Sherry Baldwin's mother floats in on a wave of coffee to let Sherry know that she needs to meet her at Dairy Queen, ghost headquarters. There, Sherry learns that her stepmother, aka The Ruler, has a stalker. With her dad out of town, and her mother competing in the Ghostlympics, it's up to Sherry to solve the mystery.Sherry enlists Junie's help as they embark upon a journey of the paranormal. A ghost hunter's equipment picks up signs of her mother while a teen psychic confirms Sherry's fears about her stepmother. When The Ruler's tires are slashed, Sherry follows the scents of sweat socks and honey, and wonders what she'll do when she finds the stalker. To make matters worse, her uber-fantastic boyfriend, Josh, has a glittery tutor who seems eager to take Sherry's place. Her best friend, Junie, is too distracted to answer her texts, someone is trying to kill her fish, and her school's rival robotics team has discovered she's a spy. 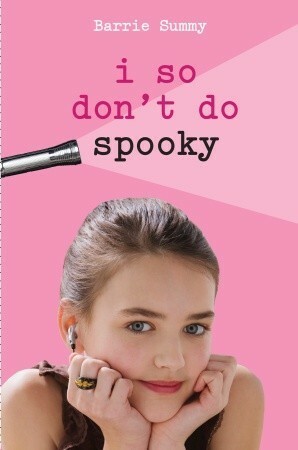 The first book I finished this school year was I so Don't do Spooky by Barrie Summy. In the book, the main characters stepmom is having strange stuff happen to her. the academy of spirits has asked Sherry to get to the bottom of it and the problem is she does not like spooky things. I give this book a 7/10 because it was a mix of comedy and paranormal and I think that is a weird combination so I gave this book a 7/10. Sherry’s got typical seventh grade issues. She’s not so great at school and she’s got a serious crush on Josh, an uber cute eighth grader, and makes an unforgettable impression on him by bloodying his nose. Plus, her dad’s engaged to Paula, the math teacher at school, aka The Ruler. But if you’re thinking that I SO DON’T DO MYSTERIES is just another book about an everyday teen who just wants to be loved, you’d be so wrong. There’s nothing normal about Sherry’s spring break. You see, Sherry had bi Sherry’s got typical seventh grade issues. She’s not so great at school and she’s got a serious crush on Josh, an uber cute eighth grader, and makes an unforgettable impression on him by bloodying his nose. Plus, her dad’s engaged to Paula, the math teacher at school, aka The Ruler. But if you’re thinking that I SO DON’T DO MYSTERIES is just another book about an everyday teen who just wants to be loved, you’d be so wrong. There’s nothing normal about Sherry’s spring break. You see, Sherry had big plans for her break. Plans that involved sleeping in, shopping, and then more shopping with her best friend Junie. Until her dad told her that he and The Ruler have moved up their wedding date to this weekend. And she’ll have to spend her break in San Diego with her aging great-aunt. Course, that’s better than staying with her little brother at her dotty old grandma’s house. The same one who believes in ghosts and thinks she communicates with the spirits. Shoot, she even thinks her dead husband is a bird. How weird is that? When Sherry goes outside to curl up in her favorite pear tree, her mother, (who, by the way, was killed in the line of duty a year and a half ago), shows up in a rush of wind and a cloud of coffee, and Sherry’s no longer sure what’s weird and what’s not. Even stranger, it turns out her mother needs her help solving a case of unauthorized banana treats at a rhino enclosure in, (you’ll never guess), San Diego! Her? Sherry? Go undercover? Think on her feet? Solve a mystery? No way. Sherry’s always been the one most likely to mess up, if she doesn’t freeze up first. But no matter how bizarre it all sounds, her mother needs her. Actually needs her! It doesn’t take long to convince her dad to send Junie with her to San Diego, even if it does mean she’s also going to have to put up with Junie’s older cousin, Amber. Soon, Sherry’s up to her elbows in meringue and buckets of coffee, pounding the pavement like a regular ol’ sleuth till she’s got blisters on her feet. Who’s trying to kill the rhinos and why? Will she be able to find out in time to save them? Will her directionally challenged mother be able to find her so they can work together as she promised? Can she trust Junie with her secret? And what about Josh? Will he forget she even exists while she’s gone? I SO DON’T DO MYSTERIES is a funny, engaging debut novel and Sherry’s antics will keep you turning pages since nothing happens as expected. Ms. Summy’s title suggest she so doesn’t do mysteries, but I believe she does them very, very well, and I surely hope she will be brewing up more mysteries for Sherry and her mother in the future. I really don’t want to get involved—my life is way too busy. Josh and I are celebrating two blissful months of togethernes Someone’s out to get Sherry’s stepmom. . . .Can she save her before it’s too late? But . . . I so don’t do spooky. This book is ok. If you're looking for a fun, quick read, this is your book. Sherry Baldwin is out to solve another mystery. I really love how the author narrowed down the characters and made the book spooky and funny. It was interesting watching Sherry try to solve the mystery while trying lead a normal, girly, fashonista, teen life. The pace was just right and the relationship, between Josh and Sherry was cute. I also love Sherry's little sacrifice at the end. The annoying parts were the way the author trys to make it sound so, teenage-ish. Or at least she attempts. It was really getting annoying hearing 'uber-something' so much and the rest of the attemp to sound like a teenager. Also the book wasn't as funny as the first book. Sure I did get a few laughs but not as many as I expected. Lastly the book was a bit predictable. I knew who the stalker was and all that stuff. Overall the book was enjoyable and fun. Sherry Baldwin's mother floats in on a wave of coffee to let Sherry know that she needs to meet her at Dairy Queen, ghost headquarters. There, Sherry learns that her stepmother, aka The Ruler, has a stalker. With her dad out of town, and her mother competing in the Ghostlympics, it's up to Sherry to solve the mystery. But, she so doesn't do spooky. Sherry enlists Junie's help as they embark upon a journey of the paranormal. A ghost hunter's equipment picks up signs of her mother while a teen psychic confirms Sherry's fears about her stepmother. When The Ruler's tires are slashed, Sherry follows the scents of sweat socks and honey, and wonders what she'll do when she finds the stalker. To make matters worse, her uber-fantastic boyfriend, Josh, has a glittery tutor who seems eager to take Sherry's place. Her best friend, Junie, is too distracted to answer her texts, someone is trying to kill her fish, and her school's rival robotics team has discovered she's a spy. Barrie Summy's I SO DON'T DO SPOOKY is a wonderful romp between teen and paranormal worlds. I thoroughly enjoyed Ms. Summy's first novel, I SO DON'T DO MYSTERIES, and was eager to read I SO DON'T DO SPOOKY. I was not disappointed. It was just plain fun. I So Don't Do Spooky is about a girl named Sherry Baldwin who can contact her dead mother. Her mother is a ghost who Sherry can hear but not see. Her mother has been admitted into the Academy of Spirits, and in order to stay there she needs to solve mysteries. Sherry and her mother now have to solve a mystery involving Sherry's new stepmother, Paula Paulson, AKA The Ruler. She's a bossy health-food nut who works at Sherry's school. Apparently, The Ruler is being stalked. Sherry and her friend, J I So Don't Do Spooky is about a girl named Sherry Baldwin who can contact her dead mother. Her mother is a ghost who Sherry can hear but not see. Her mother has been admitted into the Academy of Spirits, and in order to stay there she needs to solve mysteries. Sherry and her mother now have to solve a mystery involving Sherry's new stepmother, Paula Paulson, AKA The Ruler. She's a bossy health-food nut who works at Sherry's school. Apparently, The Ruler is being stalked. Sherry and her friend, Junie, need to find out who- or what- it is. I liked this book because I liked the first one. This is the sequel to I So Don't Do Mysteries, and I found that funny and relatable. Sherry is so funny and I love her teenager-ism. I feel like she is a lot like me! This book is 4 stars because it wasn't perfect. No book is. I wasn't thinking, "WOW THIS IS SO AMAZING I NEED TO GO TELL ALL MY FRIENDS AND FAMILY AND READ IT SIX BILLION TIMES AND SHOUT IT FROM THE ROOFTOPS THIS BOOK SHOULD BE BROADCASTED ON NATIONAL TELEVISION!!!!" It was cool. It was fun. It wasn't perfect. When Sherry Holmes Baldwin is asked to help her ghost mother track down a stalker, it's not all that strange, to her, anyway. Though, it's not just any stalker, it's a ghost stalker! and they're stalking Sherry's new stepmother! Sherry has to track down the stalker, not to mention make him cross over! So, with help from her best friend, Junie, Sherry heads out to track down the stalker. This book is very fresh and original, it's an amzaingly girly version of a mystery! It's a wonderful ghost m When Sherry Holmes Baldwin is asked to help her ghost mother track down a stalker, it's not all that strange, to her, anyway. Though, it's not just any stalker, it's a ghost stalker! and they're stalking Sherry's new stepmother! Sherry has to track down the stalker, not to mention make him cross over! So, with help from her best friend, Junie, Sherry heads out to track down the stalker. This book is very fresh and original, it's an amzaingly girly version of a mystery! It's a wonderful ghost mystery with a side story of remance and friendship. Even though there are some very funny parts, it's kind of a serious book when it comes to sherry and her Mother. The story is partially about the love of a mother and daughter and partially about romance, friendship and mystery. This review has been hidden because it contains spoilers. To view it, click here. 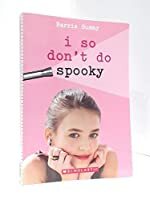 I so don't do spooky is about this girl named Sherry Baldwin and she can talk to her ghost mom and ghost grandfather which they are part of a ghost academy. She and her BF are celebrating their 2 month anniversary together. So one day she gets flowers on her steps and she thinks that their from her BF Josh morton but there actually from her step mother's Ex-husband. And then she gets involved with robotics club and she finds out that her stepmother has a ghost stalker and one of the ghosts from I so don't do spooky is about this girl named Sherry Baldwin and she can talk to her ghost mom and ghost grandfather which they are part of a ghost academy. She and her BF are celebrating their 2 month anniversary together. So one day she gets flowers on her steps and she thinks that their from her BF Josh morton but there actually from her step mother's Ex-husband. And then she gets involved with robotics club and she finds out that her stepmother has a ghost stalker and one of the ghosts from the academy, Mrs. Howard, tells her that she has to find out who the stalker is. If she finds out who it is then she will get 5 minutes of real time with her mother. Summary: Sherry has a lot to balance. Trying to get along with her stepmom, her best friend Junie, and her boyfriend, Josh. And on top of all of this, her real mom, who died and is now a ghost in the academy of spirits. Sherry and Junie agree to help Sherry's mom when Sherry's stepmom, Paula, gets a crazy ghost stalker. But when this mystery becomes too dangerous, Sherry and her mom are told to quit. But they really want five minutes of real time. Will they be able to crack this case before time runs out? Sherry Baldwin, with a little help from her best friend Junie, and her mother the ghost, solves mysteries. In this volume, it's up to her to find out who is stalking her step-mother and why. If she figures it out quickly enough, she will get a prize from the Academy of Spirits - 5 minutes of "real time" with her mother. This is a quick read and I liked that the information Sherry uncovers is presented as she learns it, so you don't know what is happening or who the "bad guy" is any sooner than th Sherry Baldwin, with a little help from her best friend Junie, and her mother the ghost, solves mysteries. In this volume, it's up to her to find out who is stalking her step-mother and why. If she figures it out quickly enough, she will get a prize from the Academy of Spirits - 5 minutes of "real time" with her mother. I thought this book was okay. Although, there were many parts that made me laugh, smile and hold my breath, there were also a lot of parts that weren't necessary in understanding the plot of the book. In my opinion, there were a lot of boring parts that made the book really hard to finish. This book is about Sherry, who seems like a regular teenager but oddly enough, she can talk to ghosts. When someone is after Sherry's step mother, it's up to her and her mom (who had past away and is now a gh I thought this book was okay. Although, there were many parts that made me laugh, smile and hold my breath, there were also a lot of parts that weren't necessary in understanding the plot of the book. In my opinion, there were a lot of boring parts that made the book really hard to finish. This book is about Sherry, who seems like a regular teenager but oddly enough, she can talk to ghosts. When someone is after Sherry's step mother, it's up to her and her mom (who had past away and is now a ghost) to get to the bottom of it and save Sherry's step mom. This book is about what people think is a regular girl detective named Sherry Baldwin, but she has an unusual partner, her ghost mom. In their latest mystery, Sherry and her mom try to find out who is stalking her new stepmom. Is it a human or ghost? This book was a very good book. I love how Sherry is in a book, but it still feels like she is alive because she relates to you so much! I also love how the mystery is set into pieces so everything makes sense and you're never truly left in the dark This book is about what people think is a regular girl detective named Sherry Baldwin, but she has an unusual partner, her ghost mom. In their latest mystery, Sherry and her mom try to find out who is stalking her new stepmom. Is it a human or ghost? This book was a very good book. I love how Sherry is in a book, but it still feels like she is alive because she relates to you so much! I also love how the mystery is set into pieces so everything makes sense and you're never truly left in the dark and at the end of the book you're like "WOW!". I think for the most part this book is awesome and doesn't really have any bad parts. this book is one of my favorites. I read it during the summertime on a long trip and it is a very fast read.the story is very funny. It is more meant for younger kids i think. this story is about a young 13-14 year old girl who finds out she can she ghosts. She soon meets her mother who is also a ghost and finds out she has a stalker. Her and her best friend overcome challenges to find the stalker and meet some people along the way. Sherry has another mystery to solve with the help of her mom, who is a ghost, and her grandfather, who is a bird! Keeping with the fun title, Barrie writes with a believable and humorous first person voice. Someone is stalking the Ruler (her step mother) and Sherry has to solve the mystery to gain Real Time with her mom. Barrie's word choice kept me turning the pages to an emotional ending I wasn't prepared for. A must read if you are looking for a fun read with depth! I like this book, I didn't love it or hate it. Sometimes it got a little boring and confusing, but it was worth it in the end. Some things weren't clear to me so I had to figure them out as I read the book, like how Sherry can smell, hear, and talk to ghosts. I would recommend this book to people, mostly teen girls, who like realistic fiction. This book to me was just an ordinary book, it wasn't special to me. so cute! a great mystery/supernatural series for girls. Sherry is going through all the normal tween stuff, with the added twist of being able to sense ghosts- and her mom, who has passed, recruits her to solve mysteries as a "live" helper for the group of ghosts who protects humans and tries to get those who don't want to, to cross over. LOVE Sherry- and Summy's writing is crisp, funny, and spot on for the age group. I think this book was very easy for me and would probably be good for third or fourth graders because they use a lower level of vocabulary and it is pretty short. If you like mysteries this would be a very good book for you and also the book I so don't do mysteries. Over all it was a really good book. This book was interesting, capturing, thrilling, sentimental, and amazing. Everything you could want a book to be. I loved this book but that's certainly expected since I love this series. But this book had a lot more to it and I felt that you could understand Sherry and Sam's relationship much better. It was definitely MORE than worth reading. Definitely read this book! I loved it! Barrie Summy grew up in Canada on a steady diet of books and tobogganing. She tries to read a book a week and always breaks for tea and cookies at three oclock. Barrie lives in California with her husband, their four children, a veiled chameleon, and Dorothy the Dog.